Lay a large piece of plastic wrap on your counter (I pressed two long sheets together at the edges to create a single larger sheet). Unfold the first sheet of puff pastry in the center of the plastic, then roll it into a 10×12-inch rectangle. Spread with 1 1/2 tablespoons mustard, leaving a 1/2-inch border on all sides. Lay 6 ham slices on top, overlapping as needed. Sprinkle with 1 cup cheese. Starting at the long (12-inch) edge, roll the puff pastry into a log. Trim the ends so that they are even, then tightly wrap the log with the plastic wrap. Place in the refrigerator for 20 minutes. Repeat with the second sheet of puff pastry and remaining mustard, ham, and cheese. Preheat your oven to 375 degrees F and line two baking sheets with parchment paper or silicone baking mats. Once the log has chilled, using a sharp, serrated knife, carefully cut each log into 1/2-inch-wide slices. (If each log is 12 inches, you will get 24 rolls from each one). Arrange the rolls 1 inch apart on the prepared baking sheets. 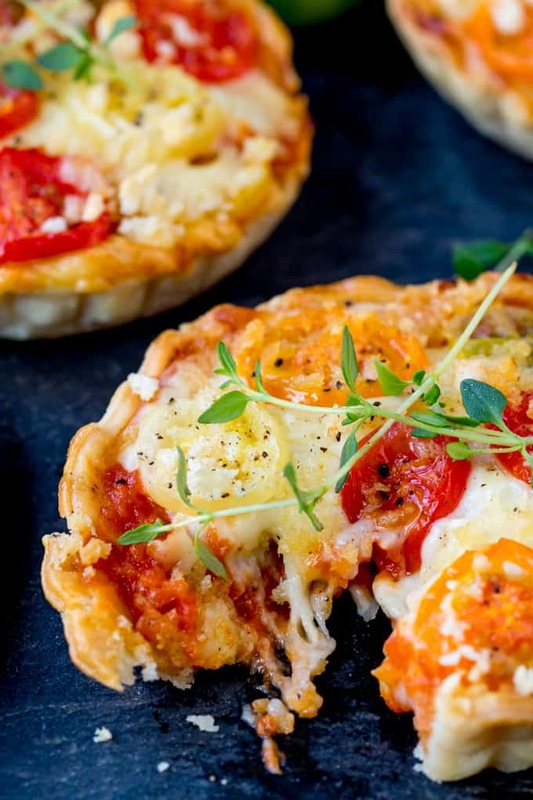 Bake until the puff pastry is light golden brown and the cheese is hot and bubbly, about 18 minutes. Immediately sprinkle with chopped thyme, parsley, or chives as desired. Let cool slightly. Serve warm or at room temperature. To make this recipe ahead: Fully bake the pinwheels, then let cool. Arrange in a flat layer on the baking sheet and freeze completely. Transfer to an airtight container and store for up to 1 month. Reheat on a parchment-lined baking sheet at 375 degrees F until warmed through. You could also try freezing the pinwheels unbaked, but be careful of the grated cheese coming loose. Baking the pinwheels first, then freezing, is the easiest route. Preheat the oven to 200c/400f and line a baking tray with baking parchment or a silicone liner. Unroll the pastry and brush with egg wash, then cut the pastry into approx 40 small rectangles. Place one rectangle on top of another and repeat with the rest of the pastry, so you have 20 or so ‘doubled up’ rectangles of pastry. Place on the prepared tray and bake for 10 minutes. Then take out of the oven. 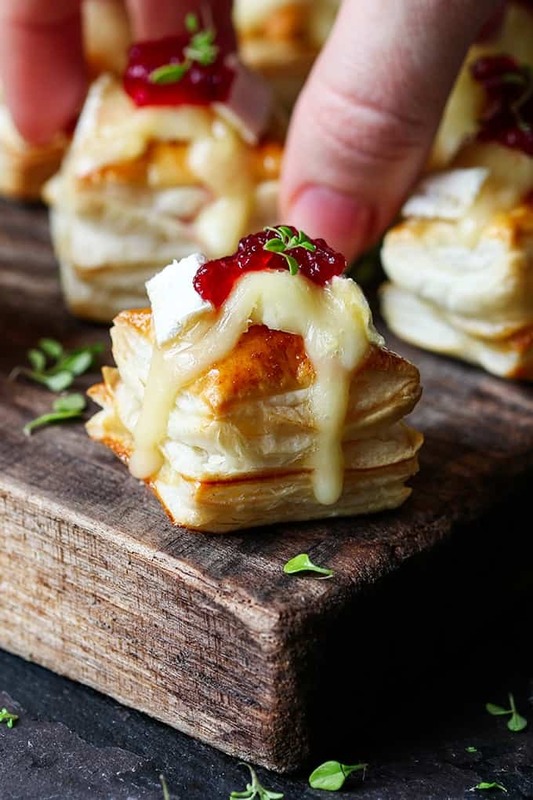 Slice the Brie into small slices and place on top of the pastry puffs. Place back in the oven for 1-2 minutes to melt the brie. Place the puffs on a plate and top each one with a small blob of cranberry sauce and a few fresh thyme leaves, then serve. First make the ragu. Heat the oil in a medium sized frying pan or sauce pan and add the onion. Cook on a medium-low heat for 5 minutes, stirring occasionally, until the onion starts to soften. Add the garlic and cook for a further 1 minute. Add in the tomato puree, oregano, sugar, tinned tomatoes, salt and pepper. Stir, bring to the boil, then simmer gently, stirring occasionally for 15 minutes. Turn the heat off. Whilst the ragu is cooking, make the tart cases and bechamel. Unroll the pastry and put 6 x 10cm loose-bottomed tart tins to one side. Cut the pastry into six squares – they should be bigger than the tart cases. Use the pastry to line the cases and push the pastry right into the grooves of the cases. Cut off excess pasty, but leave a bit of an overhang, as they will shrink back slightly during baking. Line each pastry case with a square of baking parchment, then add tbsp of uncooked beans/lentils/rice to each. Place on a tray in the oven for 10-12 minutes to ‘blind-bake’ until very lightly browned. This blind baking will ensure the pastry is fully cooked and not soggy later on. Remove from the oven and carefully remove the beans/rice and baking parchment. Now make the bechamel. Melt butter in a medium-sized saucepan. Add the flour and stir with a whisk to combine. It should form into a thick paste. Heat for 1 minute on a medium-high heat whilst stirring. Slowly add the milk, a bit at a time and whisk slowly after each addition to combine and remove any lumps. Continue to stir until the sauce is very thick, then stir in the cheddar, mozzarella and black pepper. Taste and add a little salt if you think it needs it. Take your pastry cases, and brush beaten egg all around the rims. Spoon the tomato ragu into the pastry cases – two heaped tablespoons for each. Top each with two heaped tablespoons of the bechamel. Arrange the sliced tomatoes on top, then sprinkle any gaps first with panko breadcrumbs, then with cheddar. Place in the oven and bake for 15-20 minutes until golden brown. Remove from the oven and leave to cool for 5 minutes, then carefully remove from the tins. Top with fresh thyme sprigs and serve with a big green salad. Nutritional Information is per tart. **Note** 275g (9.7oz) of pastry was used in the calculation, as not all of the pastry amount is used.